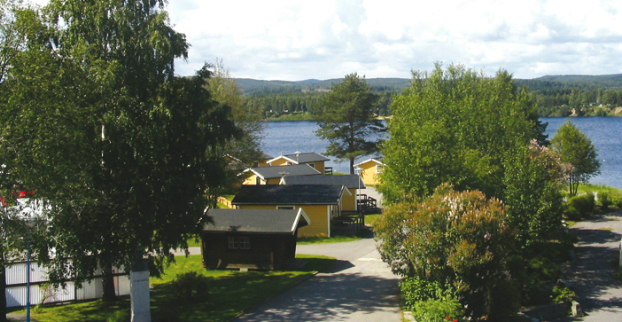 Bergeforsparken Camping and Stugby, beautifully situated on the E4 and the Indalälven river estuary, close to the delta area, offers 24 well-equipped larger cottages and 12 well-equipped smaller ones on a very scenic site. Good disabled facilities. The campsite has a heated swimming pool with a well-used kiddies? pool ? a real attraction for families with children. Swimming school at the beginning of the season. Playgrounds, mini-golf, Sami-style grill hut. In the campsite reception there is a mini-market and a small café next door, open between 8 am and 10 pm every day 15/6-15/8. 9 km to Norrland?s largest shopping centre, 5 km from Midlanda Airport. Salmon farming, some of the best salmon fishing in the country. Timrå Golf Club right next door to the campsite. Riding on Icelandic ponies close by. Paddle your canoe in Sweden?s largest coastal delta. Travel the Inlandsleden and visit Vättaberget, Rolf Lidberg?s troll village, the Thai Pavilion and Döda fallet (?the waterfall of death?). Gudmundstjärn?s self-subsistent home still in tact from the 18th century. Höga Kusten, the island of Ulvön, Höga Kusten Bridge and its surroundings, etc.